Keeping the public informed of mosquito and virus activity in our district is an important part of our program. We use a variety of methods to reach out to the public such as news releases, radio, newspapers, printed materials, presentations and participating in community events. Outreach provides us the opportunity to interact with the residents in our district, keep them informed about mosquito and virus activity in the area, and provide them with strategies on how they can protect themselves from West Nile Virus. 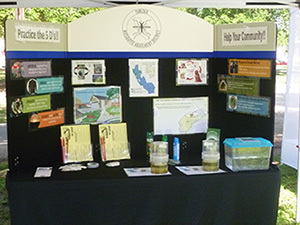 The district works with the Stanislaus County West Nile Task Force in a partnership with the Stanislaus County Health Services Agency, Eastside Mosquito Abatement District and others to increase communication and public awareness. Please submit a request to "Request a Presentation".